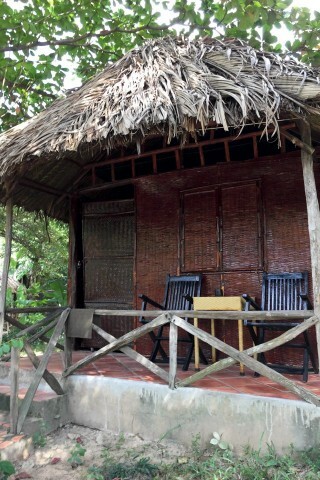 If your beach holiday dream involves rickety thatch bungalows and grumpy, surly staff, Moon Resort is the ticket. Though new brick bungalows are sprouting up all over Long Beach, Moon has eschewed solid walls for a rustic, earthy feel though the bungalows, which are dotted throughout the jungley property, have been upgraded with a solid concrete base. Backpackers can now look forward to comforts such as terracotta tiles underfoot and a fairly new tiled ensuite private bathroom. Rooms are equipped with a fan, mosquito net and bed with a proper mattress. The front porch, which comes with a few chairs and a table, is a pleasant enough spot to hang out. We’re doubtful these thatch huts would do well against the elements during rainy season, and the doors seem pretty flimsy so if you’re worried about security, opt for the concrete cottages which are located closer to the beach – they come with the same amenities. They are sturdier, blander and some have air-con. Moon Resort also has a beach bar/restaurant and loungers with umbrellas for guests. For a backpacker on a budget, this is poor value for what you get but this remains one of the cheapest beachfront properties on Long Beach and it also happens to be in the liveliest section. The room rate certainly doesn’t include any smiles from the sullen reception.